Club dark on November 29th. Happy Thanksgiving. Alan Baer led the meeting and although capable is not as pretty as our current President. Norm Foley led the pledge and Stoney led the moment of silence. Sid’s thought for the day: When you do more than you are paid to do, you will soon be paid more for what you do. Hovic Kokochian, Dan Tanita’s visiting dentist for the last month who was graciously housed in several Rotarians’ homes during his stay, will fly back to Russia with his mom after a short trip to LA. Hovic’s mom Nilavyan said that she was amazed when she visited America years ago on a dental exchange program and was so moved by the program run by Richmond Rotary that she went back to St. Petersburg and started a Rotary club there, now called the White Nights Club. Both Hovic and Nilavyan were very thankful to the club and to Dan Tanita for the Dental Exchange program. Our Russian friends presented several gifts and thank you certificates our club. Have you contributed yet to the Holiday Auction, December 6th. Our most important fundraiser of the year is only a few days away, so please add your contribution today! Use our handy Holiday Auction contribution form. And don’t forget part two: point your friends to our Auction page, then invite them to spend holiday dollars at the lively event. 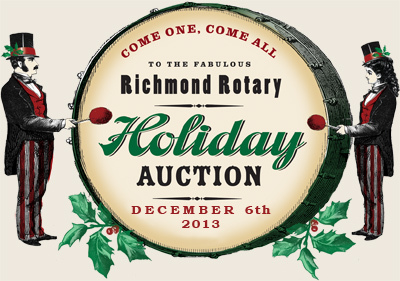 Richmond Rotary’s Annual Holiday Party will be held on December 6th at 6pm, at the Richmond Country Club. Dinner will be served at 7pm. The terrific dance band, GTS, begins playing at 7:30. The buffet-style dinner will offer a chicken, beef, or pasta dish. The Kiwanis Club of Richmond will join us this year. $150 per couple, and $75 per person. Richmond Country Club. Buy tickets online (see right side column) or mail checks to David Brown. Mark and Stoney want everyone to know that they will once again hold a BBQ at Mark’s house featuring Stoney’s award winning BBQ sauce. The holiday bikes are getting close to the full match of 100 bikes. Each bike and helmet combination is $47 so if you still want to donate get your checks into David Brown ASAP and get the full match of 100 bikes. Alan Baer will hold a Typhoon Relief Fundraising BBQ at his house on Saturday November 23 at 3001 Barkley Drive. Richmond CA 94806. The Rotary Trading Post is now up and running on the Rotary 5160 District Website. You can buy and sell goods so check it out. The Vespa for Bangladesh needs a friend. If we can raise $700 more we can purchase the 2nd Vespa. The Vespas will be used to get out to the villages and train people about arsenic in the water. December 13, 2013 is our annual toy drive, in cooperation with the Richmond and El Cerrito Fire Departments. Bring your new unwrapped toys to the meeting the firemen and women will distribute them to deserved children in the community. Cheryl Waits, a registered nurse, owns the company, Life Changing Ways. Ms. Waits is a professional Life & Health Coach and Nutritional Consultant. She grew up in New Jersey, and faced numerous health problems growing up. When she moved to Fairfield, Calfironia, the health problems, including numerous allergies, continued. When Ms. Waits began focusing on nutrition for good health her health problems cleared up. She has been free of those conditions for over 20 years. She distinguished between nutrition and diet. Diet is the food we eat and nutrition is the specific nutrients that your body requires to build and repair cells. The secret to living longer, with a good quality of life, starts with nutrition.